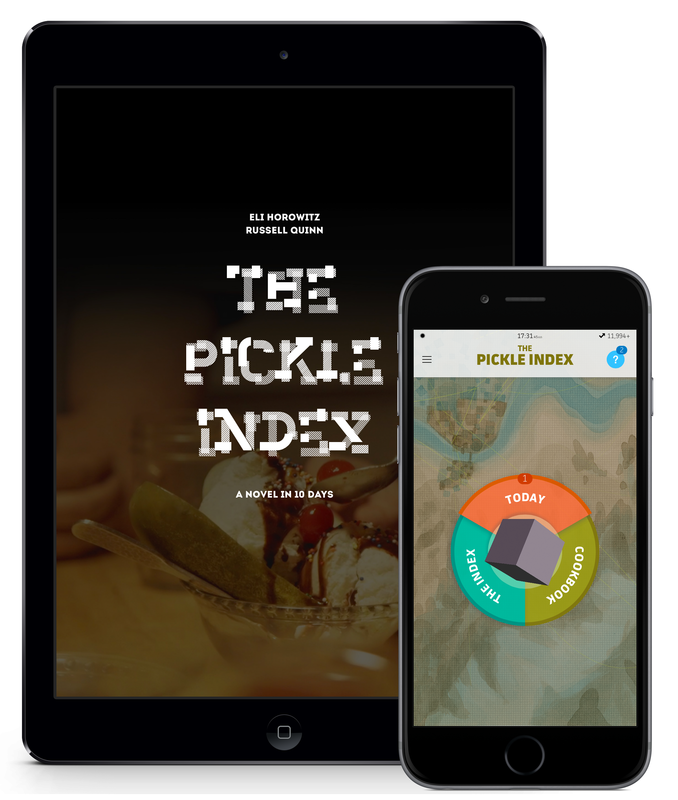 The Pickle Index, released on November 3, 2015. The way we tell stories is changing. App-based, multiplatform and interactive novels and works of nonfiction are the new wave – such as Eli Horowitz and Russell Quinn’s The Silent History, The New World, and their latest collaboration, The Pickle Index. We invite applications from all writers who wish to use interactive technologies and associated digital concepts to explore, push boundaries, and create new forms of innovative narrative. This program offers participants hands-on support to develop their own project with expert faculty. Participants will work one-one with faculty and partake in group discussions with peers culminating in an open studio. Banff Centre will provide the necessary resources and facilities (including studio space) to develop the digital aspects of a fiction or nonfiction narrative during the residency. Participants will also receive project support, mentorship, and facilitation from other creative and technology professionals with previous experience in immersive, multi-platform storytelling. By the end of the three weeks, we anticipate that each participant will have a prototype of their digital narrative. Participants will leave the Banff Centre better equipped to further develop, produce and pitch their projects to digital publishers, including Banff Centre Press. This program is open to writers from all literary genres, including fiction, non-fiction, screenwriters, documentary makers, animators and graphic novelists working within the digital landscape to produce a new literary project. Applications from collaborative teams may also apply (you will be asked to specify if your project is collaborative on the application). Create in one of our specialized studios and utilize shared production facilities in digital media. Collaborative groups share studio space. Financial Aid up to approximately 75% is available for this program. If you would like to be considered, please complete the Financial Aid section when uploading your supporting materials to SlideRoom. Help fund your experience at Banff Centre -- View a compiled list of national and international opportunities here. Names, addresses, telephone numbers, and email addresses of two persons willing to provide a recommendation. A brief description of your complete project including a summary of what you hope to carry out during the 3 week residency at The Banff Centre (1-2 pages max). Please upload up to 5 samples of your artistic work that will support your application. Please include title of work, date created, mediums used, and size. Are you available to attend the three week residency in full? Have you worked on a digital narrative project before? If yes, please provide an overview of your role in that project. Have you worked with programmers, animators, designers, artistic or technical directors in the past? If yes, please describe the experience. Please provide one or two examples of digital narrative projects or artists that inspire you/your work.What kind of artists/creative professionals/technologists do you hope to collaborate with, and/or consult with in Banff to help develop your project (you may name names if you wish)? By the end of the three week residency, we anticipate that participants will have a fully conceptualized storyboard of their proposed project. Time and resources permitting, if there were one or two aspects of your proposed project that you could work through more fully during your three week residency, what would they be? How do you envision your audience interacting with your story? What interaction and what technologies do you see as key components to your proposed project? Where do you hope to have your project published? Outline any studio, equipment, facility, or staff support related to your project execution/completion in the Forms section in SlideRoom. Adjudication shall be based on artistic merit and the ability of Banff Centre to help realize the project. All projects must clearly demonstrate strong potential for publication on a digital platform. Applicantswill be notified of their status as soon as adjudication is complete, approximately 3-5 weeks following the application deadline. Critical Art Writing Ensemble residency explores art writing as an aspect of literature. Participants will contemplate and compose writing combining poetic potential and serious analysis.